CoreBiotic™ Sensitive was specifically developed for patients who are sensitive to prebiotics and/or are following a low FODMAP diet. CoreBiotic™ Sensitive includes the same 11 billion CFU’s per dose and the same researched-based strains as CoreBiotic™, but without the VitaFiber™. CoreBiotic™ Sensitive represents the latest in advanced probiotics, combining 3 fully sequenced and registered soil based strains. Each of the strains were specifically chosen for their supporting science. 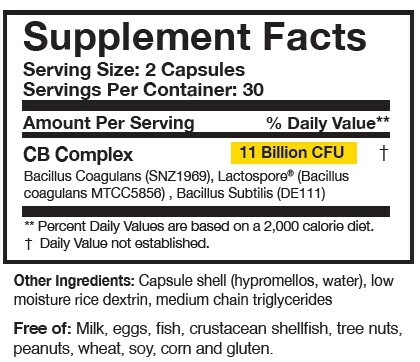 Researched Nutritionals CoreBiotic™ Sensitive combines three spore forming probiotics to help promote the development of a healthy digestive microbiome. Spore based probiotics are derived from the soil. Traditionally when people consumed organic produce they ingested soil-based probiotic organisms (SBO). These SBO’s helped maintain a normal microbiome in the intestines. Today with processed foods containing pesticide and hormone residues, people do not consume these beneficial SBO bacteria leading to dysbiosis or microbial imbalance. Spore forming probiotic bacteria can withstand stomach and bile acid. This allows them to pass into the intestines safely without degradation. Once in the intestines they leave the spore form and produce lactic acid which has natural antibacterial properties to prevent growth of pathogenic bacteria. This competitive inhibition helps the beneficial probiotic bacteria proliferate. Each probiotic in CoreBiotic™ Sensitive is identified by genomic sequencing for a specific strain. Only strain-specific probiotics have undergone rigorous genomic studies, guaranteeing accurate strain specificity, potency and safety. Each of the strains in CoreBiotic™ Sensitive has research on its safety and efficacy.